Shop online and receive an additional 5% discount on anything and everything (except 2016 Cissy, Favorite Friends and Sweet Baby Nursery Collections, and items under $40) at The Matilda Company. To receive your discount, shop online and use coupon code matilda in the coupon box in your shopping cart. Little is known about �The Mystery Dolls� Madame Alexander created in 1951 except they won a coveted Fashion Academy Gold Medal. How many were made and who inspired them may never be discovered. We honor and continue our mysterious past by introducing the third shadow Cissette in our Mystery Doll Collection � Deborah Bride. Deborah is ready to make hearts aflutter in her elegant Victorian bustle wedding dress. 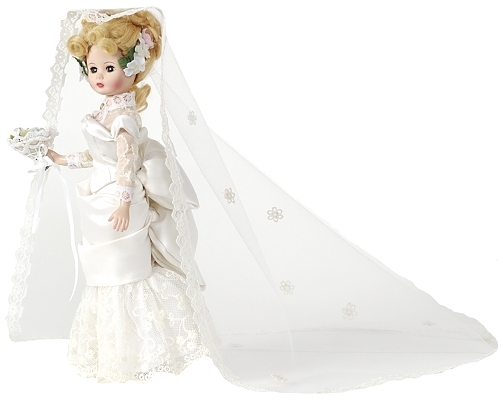 The tulle veil accentuates the flowers in Deborah�s blonde hair, while her floral bouquet add an additional touch of elegance to this 10� articulated Cissette.